He’s leading her on. What a git! My hope that Sue would soak up this episode in revered silence is dashed within seconds, mainly because we get embroiled in two very tedious discussions. Well, tedious to me, at least. Sue: Why have they decided to visit the Aztecs? I thought Ian and Barbara wanted to get back to 1963? Me: They’ve arrived here by accident. Me: Well, the TARDIS doesn’t work properly. Sue: Really? I didn’t know that. I thought the Doctor had fixed it. So when does it work properly? It seems to work all right in the new series. I thought the Doctor could go anywhere he liked? Sue: DAVE? Is that DAVE? Yes, Tlotoxl has turned up and Sue is convinced that The League of Gentlemen must have based Papa Lazarou on him (it isn’t impossible, I suppose). Me: It’s actually Penny’s dad from Just Good Friends. Sue: Is there something wrong with his back or is he walking like that on purpose? Me: He’s doing a Richard III. Sue: Not a Young Frankenstein? Me: Not unless the production team are time travellers as well, no. Sue: So, why are all the Aztecs speaking English? Here we go. Why it’s taken her until now to question why everyone speaks English (including Thals, Voords and cavemen) is beyond me, but there you go. I can either tell her to wait until the 1970s for an explanation, or I can give her the official line now. 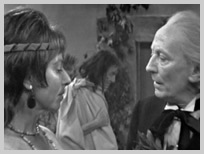 Sadly, we end up debating this during one of Hartnell’s very best moments, and she doesn’t hear his passionate warning to Barbara about interfering with history. Not one line. Me: It isn’t stated on-screen until years later, but the TARDIS translates languages telepathically. Look, this was a plot point in David Tennant’s first episode, which you’ve definitely seen. Sue: Like a Baffle Fish. Me: Yes, exactly like a Baffle Fish. Very good. Look, my wife is trying to drop references to The Hitch Hikers Guide to the Galaxy in the middle of a black and white episode of Doctor Who – you try correcting her. I have to fill in some of the important details we missed due to this diversion (“I thought the Doctor interfered with history all the time?”), and Sue concedes that the plot is a step up from last week. Sue: It’s more believable – I’ll give it that. It’s just a shame that everyone looks ridiculous. However, when Tlotoxl looms menacingly into the camera – after an incredibly bleak moment where Barbara saves a life, only for the intended victim to kill himself anyway – Sue reckons it’s the best cliffhanger yet. Sue: Now that’s what I call scary. Do you think Russell Brand has seen this? Before we watched this episode, I made Sue sit through a short DVD extra which featured Valerie Singleton giving a 1970s Blue Peter audience a potted history of the Aztecs. As a result of this, Sue is now convinced Tlotoxl is underdressed compared to the real thing and we can move on. Sue: The direction is much better than last week. It’s much more dramatic and thought out. The acting is a big improvement, too. Me: What about Hartnell? Don’t you think he’s great in this? 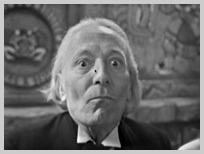 Sue: I’m sorry but I don’t think I’ll ever like William Hartnell. I just don’t get him. He’s all over the place. It’s as if he’s playing a completely different character in every scene he’s in. He still hasn’t worked out how to do it yet. As if to punctuate her complete indifference to the lead character, when the Doctor enjoys a delightful moment in the garden with Cameca, my wife decides to fixate on Ronnie Wood lurking in the background instead. She has a point, though. It is pretty weird. 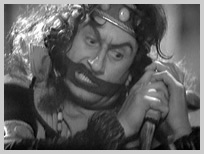 As Ian and Ixta fight to the death, Sue doesn’t understand why Ian doesn’t use his magic thumb again (“He’s copying Dr Spock!” – look, cut her some slack, she’s watching a black and white episode of Doctor Who) and when the Doctor accidentally helps Ixta drug poor Ian (not content with supplying the drug in the first place), Sue doesn’t hold back. Sue: He’s a bloody liability! Sue enjoys the romantic subplot between Cameca and the Doctor, and she laughs in all the right places. When the penny drops (reader, he married her) and Hartnell is framed in a wildly comic close-up, she can’t help but compliment him. 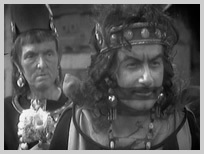 Sue: Hartnell should have played more comedy roles. He’s actually very good at comedy. The scene where the Doctor’s granddaughter rebuffs the Perfect Victim generates even more praise. Sue: Susan actually sounded like a real person for a change. If you give her stuff to do, she’s actually very good. The problem is I keep expecting her to throw a childish tantrum. She isn’t consistent. In fact, the only consistent characters in this programme are Ian and Barbara. Unfortunately, it isn’t long before the Doctor annoys Sue yet again. Sue: He’s just using that poor woman. He’s leading her on. What a git! As Ian and the Doctor search the gardens for the entrance to a hidden tomb (“I’ve never seen the Doctor move so fast; he’s almost proactive”), Sue tries to make a virtue of the show’s limitations. Sue: Ah, bless him. Ian is trying really hard to make that slab look real, even though it’s obviously made from polystyrene. Sue: Stop pretending you know anything about building materials, love. Remember who built the house you’re sitting in. And Jablite is polystyrene, you idiot. Sue watched vast chunks of the final episode in complete silence. She stopped asking questions, she stopped pointing out the cosmetic flaws, and she started biting her nails. 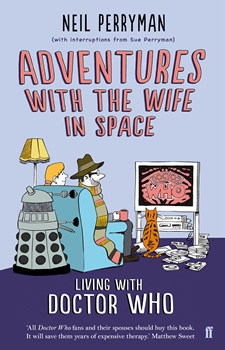 When Cameca realises the Doctor is going to leave her, and she still does everything in her power to help him escape, Sue is almost moved, although she still harbours doubts about the Doctor’s sincerity and integrity. Sue: Why doesn’t he take her with him in the TARDIS? She could be another companion. Take her with you! Interestingly, she doesn’t question the Doctor’s ability to have a relationship because he’s an alien, she simply sees him as a bit of a flirt who used his charm to get what he wanted. The swine. Me: How bleak was that? They didn’t win! Tlotoxl gets his way and the Aztec civilisation is doomed. And Autloc – the only good guy in this story – has been banished to the wilderness, and that sounds pretty fatal to me. Sue: You could remake this story today. It would look spectacular. Me: If they remade this story today, the Daleks or the Cybermen would be involved. Sue: Oh yes, there are no aliens in this – I didn’t even notice that. I suppose that makes it more educational. I like that aspect to it. As our heroes prepare to leave, the Doctor takes the brooch which Cameca gave him and leaves it on the tomb. And then he has second thoughts and slips it back into his pocket, at which point Sue makes an involuntary ‘Aww’ noise. Sue: So he really did care about her after all. Me: Don’t tell me you’re actually warming to him? Sue: A bit… A bit. I take a deep breath as Sue sums up. Sue: That’s the best one so far. The story was interesting, and fairly believable, and everyone was trying really, really hard. I don’t think I’ll ever want to watch it again, but it was pretty good. For its time. What a blessed relief. Sadly, we all know what’s coming next, and it hasn’t even been vidFIRED yet. Pray for us.